If you spend long hours looking at your pc monitor screen daily, you might want to protect your eyes by changing the background colour of your pc desktop to light green instead of the default white colour. 1. Kindly click Start -> Control Panel -> Display. 2. At the pop up "Display Properties" window, please click the "Appearance" tab -> "Advanced" button. 3. At the pop up "Advanced Appearance" window, please click anywhere within the "Window Text" area. The "Item:" will automatically change from "Desktop" to "Window". Kindly click the "Color 1:" drop down menu and click the "Other..." button. Kindly click "Add to Custom Colors" and click the "OK" button. Click "OK" button twice to exit from the "Advanced Appearance" window and from the "Display Properties" window. 1. Kindly click Start -> Control Panel -> Display -> Personalization. 2. Please click "Window Color". 3. 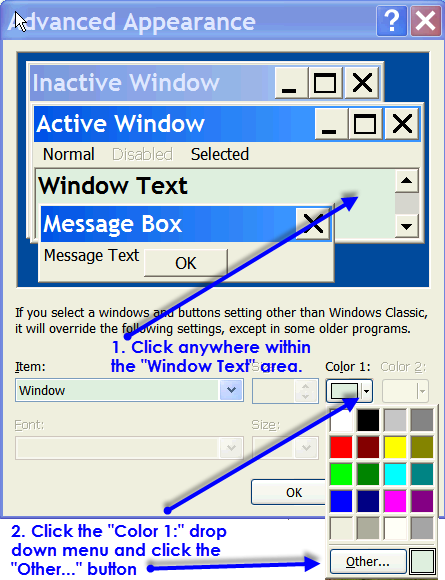 At the pop up "Window Color and Appearance" window, please click anywhere within the "Window Text" area. The "Item:" will automatically change from "Desktop" to "Window". Kindly click the "Color 1:" drop down menu and click the "Other..." button. Kindly click "Add to Custom Colors" and click the "OK" button. Kindly click the "OK" button to exit from "Window Color and Appearance" window. 1. In Mozilla Firefox v19, please click "Tools" -> "Options" -> "Content" tab -> "Colors..." button. 2. At the pop-up "Colors" window, please check the "Use system colors" and click the "OK" button twice. This will now change your Mozilla Firefox background colour to use the system colors which is the light green color that we have just set in the Windows XP/7 "Display Properties". 1. In Internet Explorer v8, please click "Tools" -> "Internet Options". 2. At the pop-up "Internet Options" "General" tab, kindly click "colors" under the Appearance section. The "Use Windows colors" by default is checked. Apply light green color on your smartphone as well. Hi is there a version for windows 10? I used to have this on my old pc but it seems W10 doesn't have the access to change. Well, I must say MANY THANKS for this great solution. Yes, I agree with you, it was much easier to change the windows background in the older versions of Windows! This didn't change the background in my excel applications on windows 10. Assume Microsoft Excel 2010 . In Microsoft Excel 2010, please click File > Options . At the General section, please choose your prefer color scheme: Blue / Silver / Black. I prefer Black color scheme. Hi Jack, could you share how to apply the green hues on Microsoft Word documents as well? thanks! 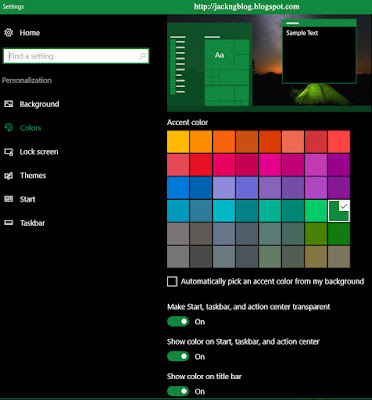 (: It is indeed so difficult figuring out how to change the green hues in Windows 10! Hi Jack how to revert to normal color in windows7 if i change my mind. Has anyone figured out how to actually do this on Windows 10? I work in word and excel a lot and really need to have a light green color for my eyes particularly in those apps. please select "Dark" under the "Choose your default app mode" section. If your Windows Operating System is Windows 10 version 1809 or higher, it will include the Dark mode for Windows Explorer.